Most golfers assume that they may take relief from young trees that are staked. Whilst this is often the case, it is only true when there is a Local Rule affording relief. The Rules of Golf do not provide relief from staked trees. Obviously, the reason that most Committees introduce a Local Rule is to protect those trees that have been newly planted, but you cannot take this for granted; you must study the Local Rules in operation before commencing a round of golf. 1. A Local Rule requires mandatory relief from staked trees. This is self-explanatory, you must take relief if any part of the tree interferes with the lie of their ball, their stance or the area of their intended swing. Read the Local Rule carefully to ensure that you are taking proper relief. 2. No Local Rule regarding staked trees. The player does not get relief from the tree, but if there is an artificial stake that supports, or did support the tree, this is an immovable obstruction, from which relief is available under Rule 24-2. No relief is available from either the tree or the stake. A point that I have made here before, which surprises many seasoned golfers, is that if there is a Local Rule making it mandatory to take relief from staked trees and the player touches any part of the tree, even a single leaf on the outermost branch, with their body or club during their next stroke, they incur the general penalty of two strokes in stroke play or loss of hole in match play, for not properly taking relief. This applies whether they took relief or not, as the Rules require you to take complete relief from any interference by the tree when there is a Local Rule requiring you to do so. When Committees decide that they do want to protect young trees on the course I strongly recommend that they strictly follow the specimen Local Rule in Appendix l, Part B, 3, so as to avoid confusion. 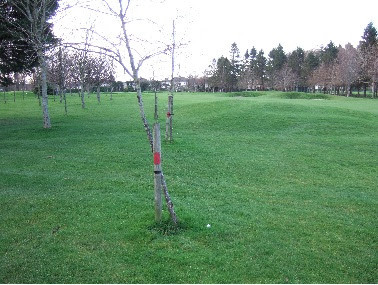 You may be interested in reading this blog item of mine from nearly four years ago, where I point out confusing deficiencies in the Local Rules for Staked Trees in three neighbouring Clubs in the South East of Ireland (please note that they may since have updated their Local Rules in this respect). I am delighted that my subscriber base grows on a daily basis. Those of you that have recently found this blog site may not know about my free, weekly ‘Rhodes Rules School’ photo series, where I use photos and diagrams to pose questions and provide answers, explanations and references to situations that we encounter on the golf course. Click here for more details. Remember that this is a free email service, you can unsubscribe at any time and I do not share email addresses with anyone. a fellow golfer's ball came to rest off the fairway up against a small tree, making it impossible to play a shot proceeding up the fairway. I suggested the only way he could play it was left-handed (unless he chipped out back towards the tee), but if he did that, his stance was impeded by an adjacent staked tree. He would then be permitted to take a free drop. Q: once he's taken his free drop, is he then permitted to play the ball right-handed? The first point is that you incurred a penalty of two strokes for giving advice on how your fellow competitor should play his next stroke!!! If the left-handed stroke was reasonable and practical in the circumstances, then the player was entitled to take relief from the interference to his stance from the staked tree (presuming that there was a Local Rule permitting relief from staked trees). Having dropped their ball properly under the Rules, the player may then play whatever stroke they deem appropriate. Do you have a view on the following, which arose today in competition. Player's ball was close to a staked tree. A local rule is in place giving relief from staked trees. However, the stake had become detached and was lying on the ground. Was this still a "staked tree". The local rule says "trees identified by stakes..." In this case it was clear that the stake belonged to this particular tree. In the situation today, the player invoked the "second ball" rule and a decision was made by a committee member on reporting the situation. I searched "Decisions" but could not find anything covering this. In my opinion the player is entitled to relief for the reason that you state. It would be very unusual for a Local Rule to specify that the stake has to be attached to the tree. I am impressed that the player played a second ball under Rule 3-3; too often players guess at a ruling without taking advantage of this procedure, which ensures that the player is not penalised for getting it wrong.